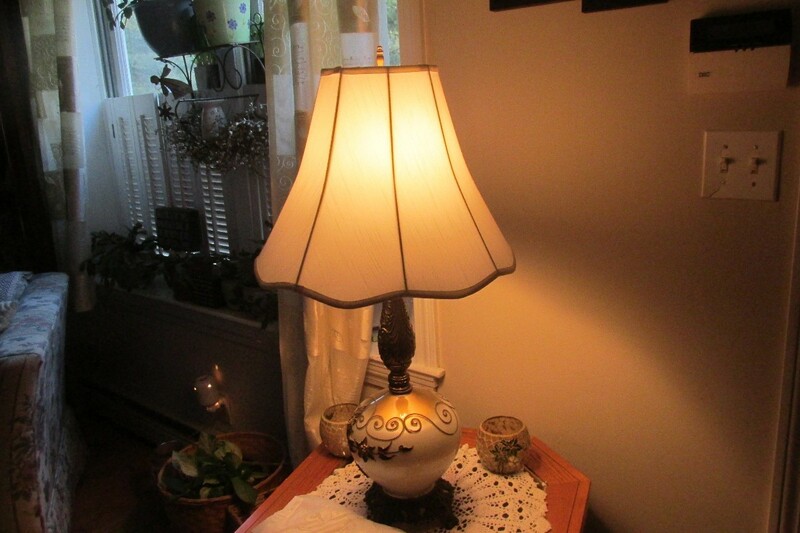 Rewire a lamp and save money. Keep track with your cell phone photos of how your lamp comes apart. This will help you reassemble it properly. 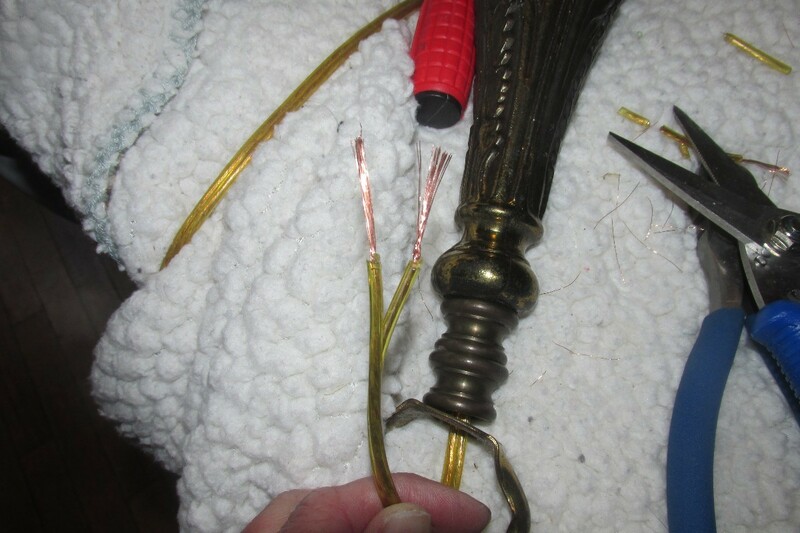 This is a guide about rewiring a living room lamp. 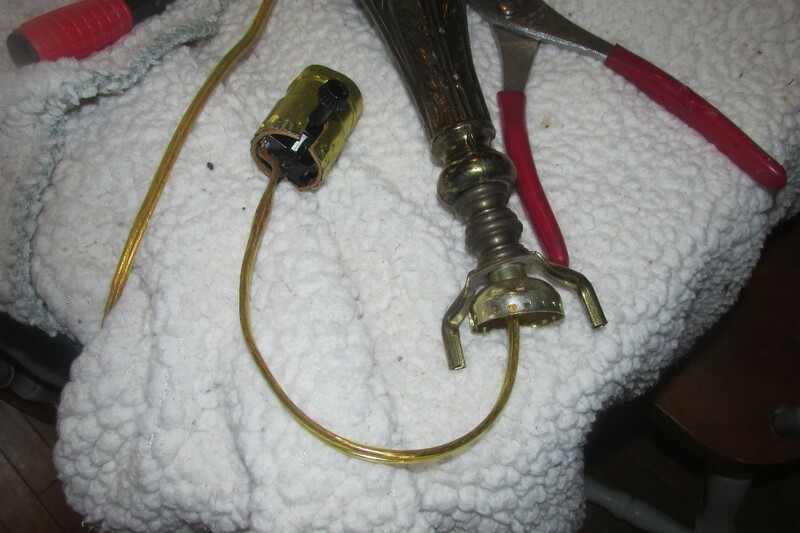 This will show you how easy it is to rewire a lamp yourself instead of paying some place to do it! 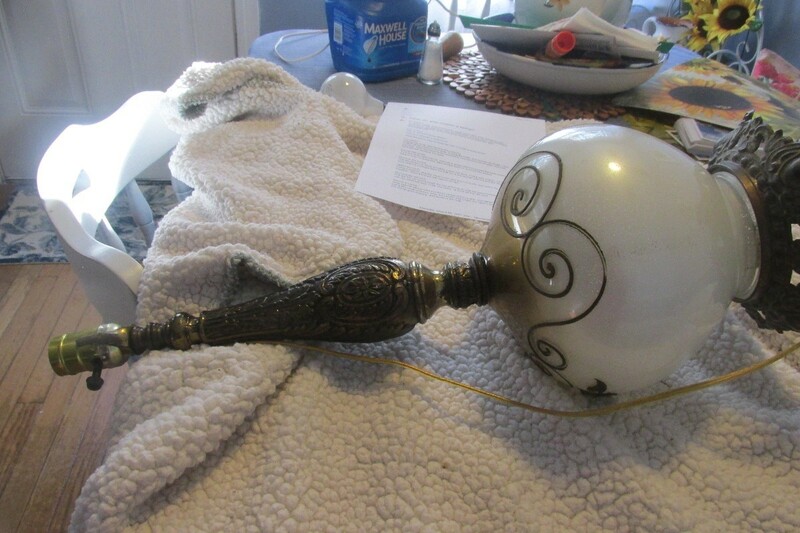 For a living room lamp, I chose gold/clear wiring with the plug attached. 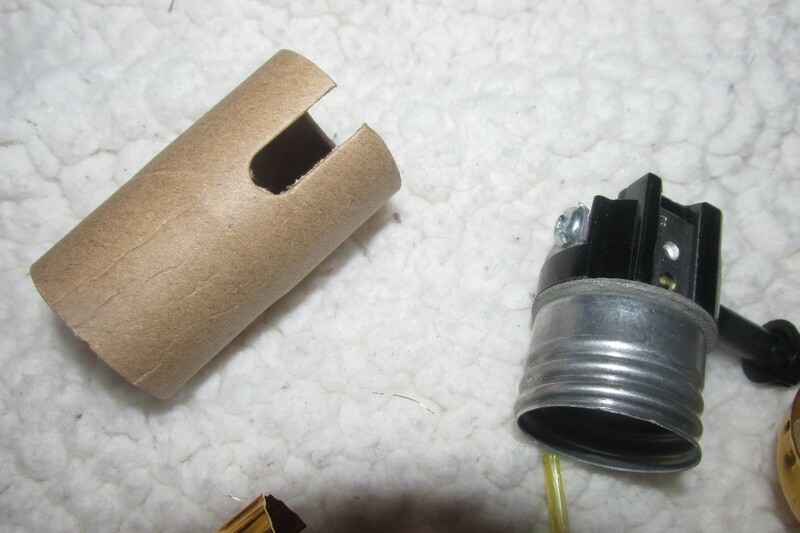 end cover that goes around the socket and make sure it has a screw on kind. Lay out a thick blanket on the kitchen table, under good lighting. This will help protect your lamp when you start to dismantle the lamp. You do not want the center globe to break or any parts to roll off. Remove the lamp shade, harp, and light bulb. Unscrew from the bottom the bolt that holds the rod that goes through the lamp. Now your lamp will loosen and slowly fall apart. 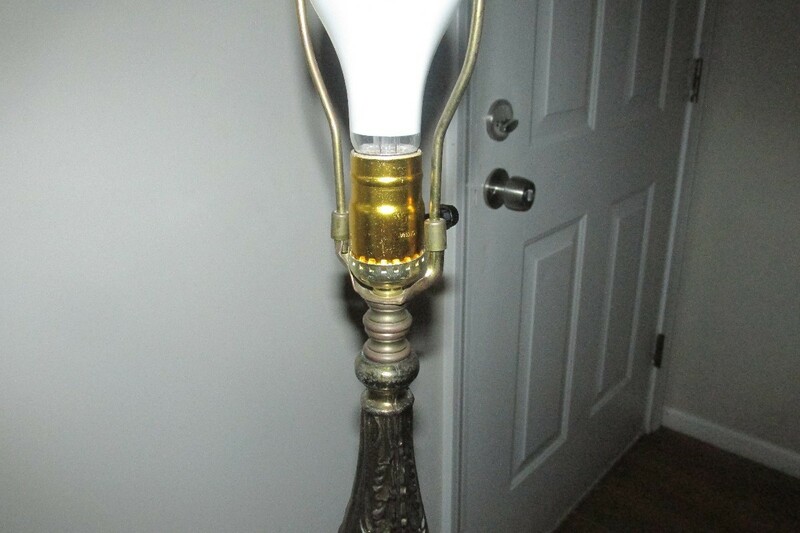 If you are doing this for the first time, using your cell phone, take a picture of the lamp as it lies on it's side. A few pictures close up, in case you can't get it back together the right way. Pull off the socket, the cord can be pulled right out. Unscrew the wires from the old socket and set them far from your work space. This will help guide you through putting together the new socket wires. Feed through from the bottom up, the electrical cord, through the rod up into the top of the lamp. Through any risers (these are small pieces that add height or decoration) on the top of the lamp. Now take your cord and with wire cutters cut through the center of the cord, splitting the cord in two. Pull the cord open about two inches. Using wire slicers, splice each cord (which just removes the outer plastic) and all you have is copper wire. 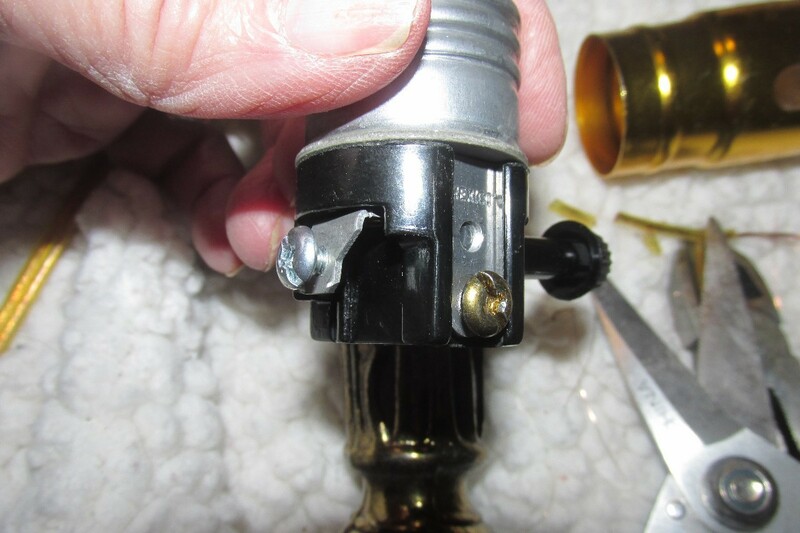 Before you connect the socket, slip the wires through the round screw on cap that goes at the base of the socket, it screws onto the rod before you put together the socket. 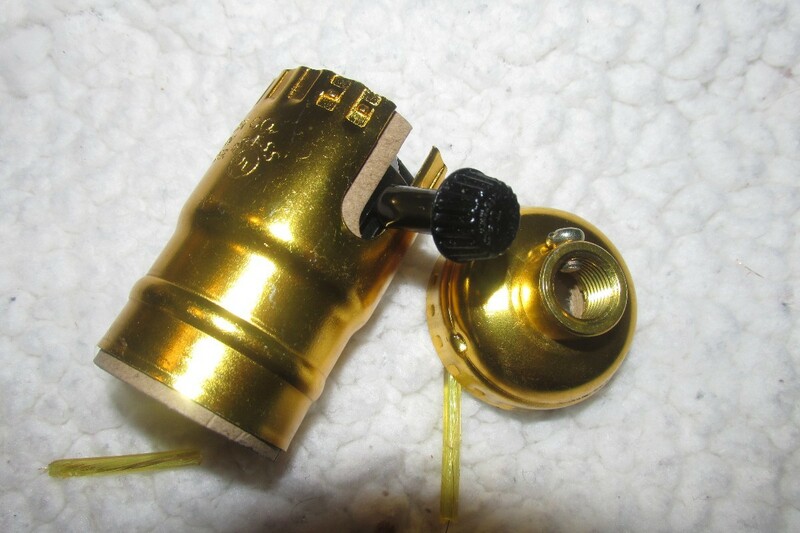 Take your new socket, remove the outer brass looking cover, then remove the cardboard cover. You will see two screws, unscrew them both. 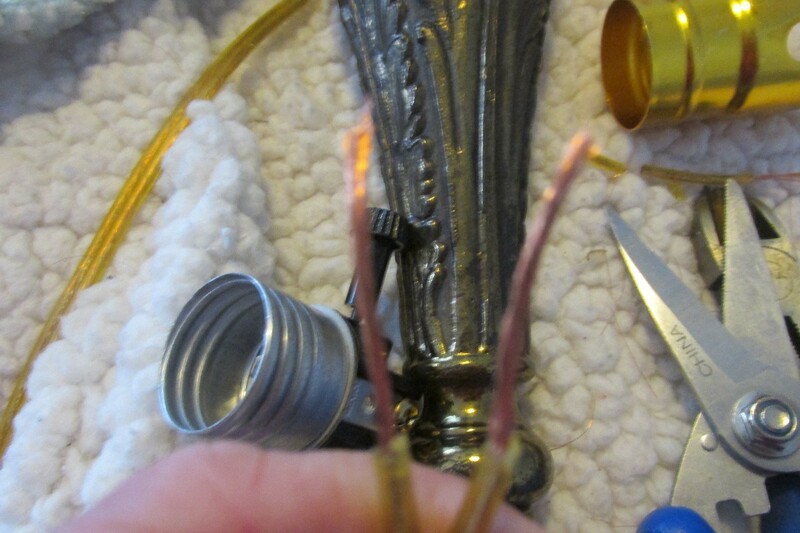 Take each side of the copper wire and twist it together with your fingers. 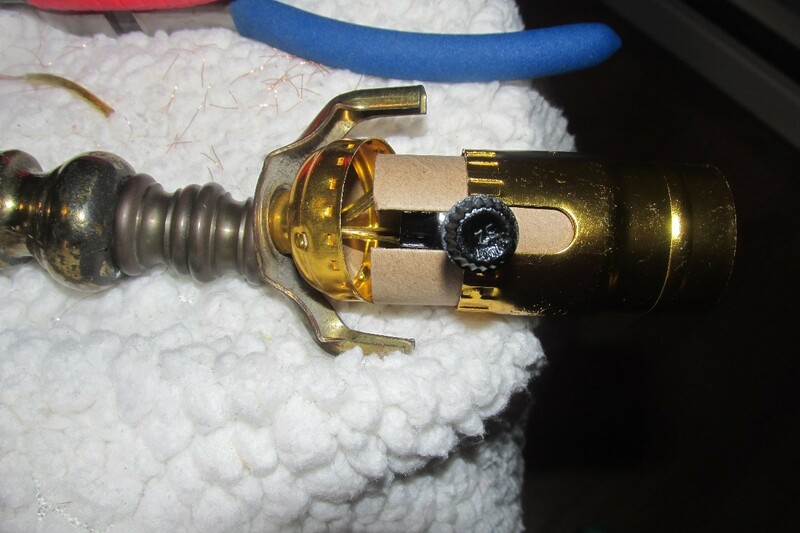 Wrap the wire around the screw on the side of the socket without leaving any wire showing, then tighten the screw. Do this to the other screw and wire. Again, making sure there are no copper wires showing and the screws are tightened. 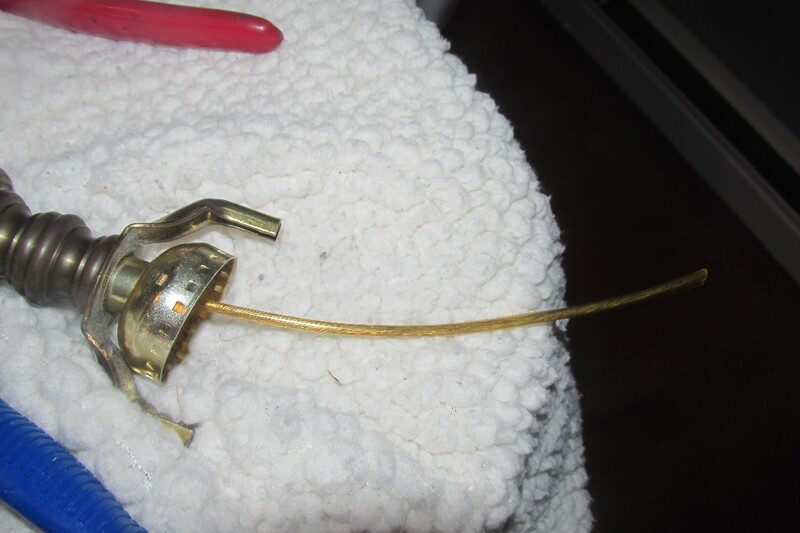 Now, replace the cardboard cover, the brass cover, attach this to the top of the lamp, by gently lifting and holding the lamp together carefully. The socket should snap onto that round screw on cap. You will here it snap on. Now, by pulling the cord from the bottom and turning the socket you can gently screw this lamp back into place. DO NOT force this too hard especially if you are working with a glass globe. You want it tight, but not too tight. Stand this up straight before you have given this a complete tighten, to make sure everything is straight, then tighten. Put a harp on it, a light bulb and plug this new (old ) lamp in. Wha-Lah! 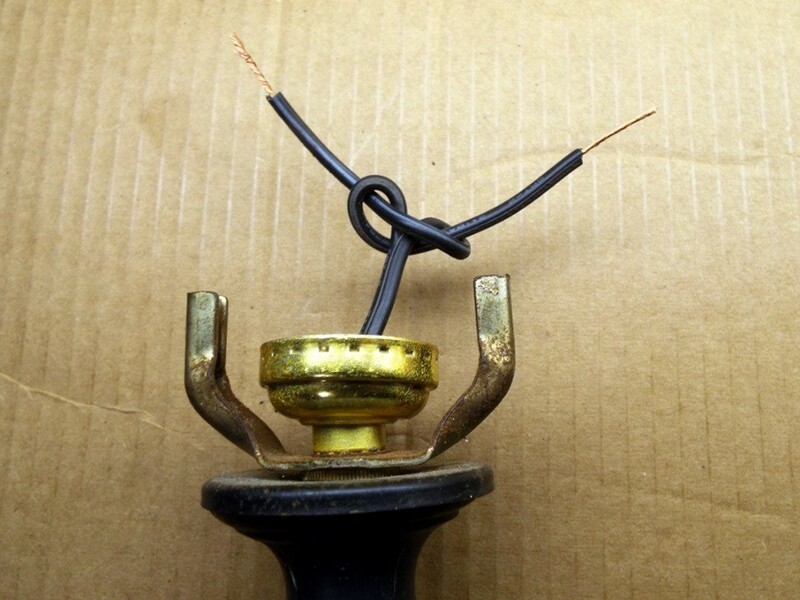 Most older lamps do not have a small plug in the base to secure the wire against being accidentally pulled out and risking the chance of a short. For that reason, I hope you wont mind if I suggest a different safety measure to take its place. 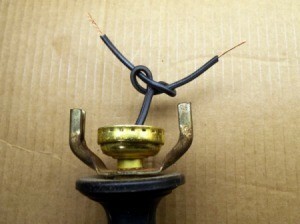 In order for the wiring to be UL approved, it requires a UL knot. The knot would be in the wire, within the socket, and just before the ends which will be screwed into the socket. I went to my junk shed and found a lamp to use as an illustration. It may take a little work to get the socket seated with this knot in place. It will be a tight fit, but it can be done. I know, I have wired thousands of lamps. I watched a YouTube video and I also put in the knot. I worked in a Lamp shade shop for years and rewired lamps daily, very old lamps mostly, and I never needed to use this technique. I was trained on the job by electrical technicians. The 'technique' is merely a safety measure and as far as I know would not be require under the circumstances you worked. Some people just feel better knowing their appliances carry the blue Underwriters Laboratories sticker. To be able to carry the sticker, the lamp would have to have a UL knot or equivalent. I wired hundreds of lamps for the desks of military officers during the Viet Nam war. It was are preference of the US government and therefore a requirement for the company I worked with that the lamps had a UL knot. If you like, I could ask Jess about removing my comments.